And since she is turning two, we have to mark the momentous occasion with another shirt for the outfit. 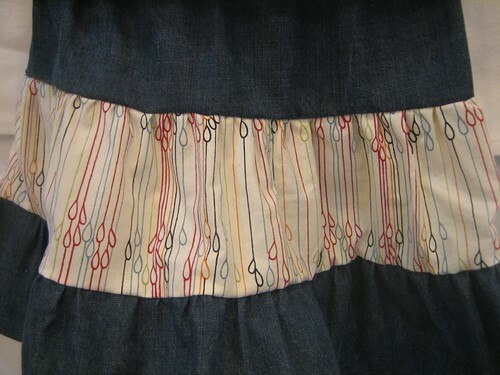 I love this striped fabric! Can you believe I made these complete outfits in ONE day? Since these outfits are going to Hawaii, I made sure the denim is really thin and a little stretchy. Now that I’m looking at these pictures, I think they look a little like school uniforms, no? Oh well, they can mix and match. 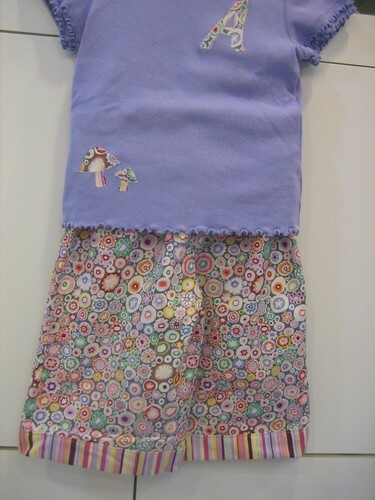 This skirt is one I’ve made a few times, but used the measurements from the Sewing for Dummies pattern #4206. I like Kuky’s tutorial, but knew that her pattern calls for *alot* of fabric with *alot* of gathers. I was using denim and knew that the denim would get thick fast so I went with the Dummies’ dimensions (ha! ), but still followed Kuky’s directions. I even made little Caps to go along with these. Chris thought I was putting initials on way to many things, but you gotta tell them apart right? The shirts I did not make, but just added the appliqués. So all and all, complete little outfits that can be worn apart or together. It’s good. 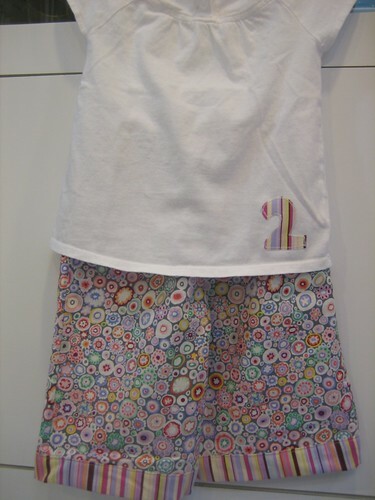 Next- more skirts, pants, Caps, appliquéd shirts, wristlets, purses, grocery totes and even wall pockets. What are you making? Very nice capris, and no one would ever know you didn’t intend that if you hadn’t said so! 🙂 I am making a version of the stuffed stars you posted a few days ago, because I really loved that idea. I am adding bells to my version. These are great outfits! I can’t believe you finished them in one day. You really did an awesome job modifying the pants into capris–they will be loved, short or long. All your sewing projects are wonderful.